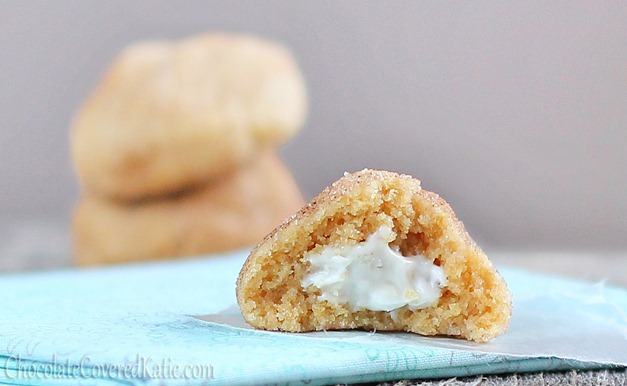 Soft and delightful cinnamon sugar pillow cookies – with a surprise filling! And a cream cheese danish… all in one cookie! It’s time for the holiday-cookie-season contest to commence. The winner is the person who crams the most cookie-baking into this one short month. Or really… the real winner is the one who eats the most cookies. 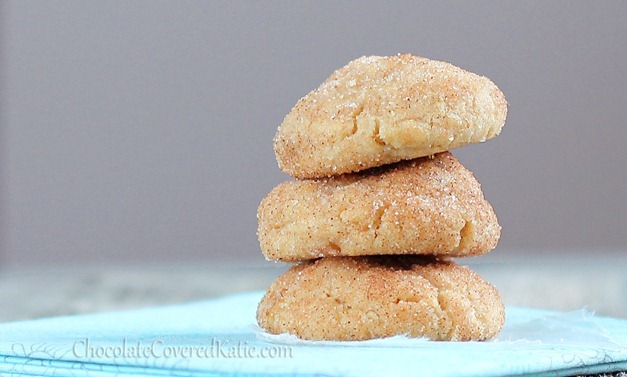 Today’s recipe is an updated version of a popular cookie recipe I first posted back in 2012. 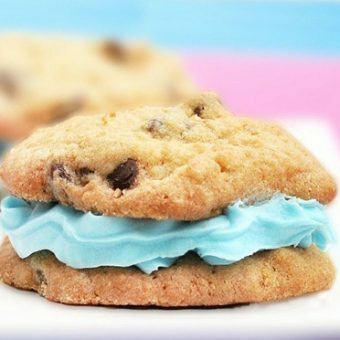 This new version of the recipe is easier to follow and makes a bigger batch, because you will definitely want more of these cookies once you try them! 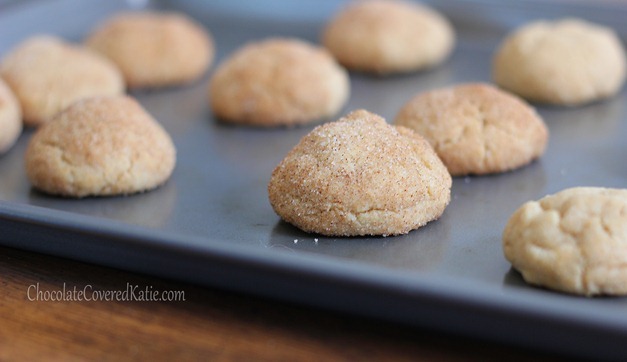 If you haven’t started baking cookies this holiday season, why not begin today? 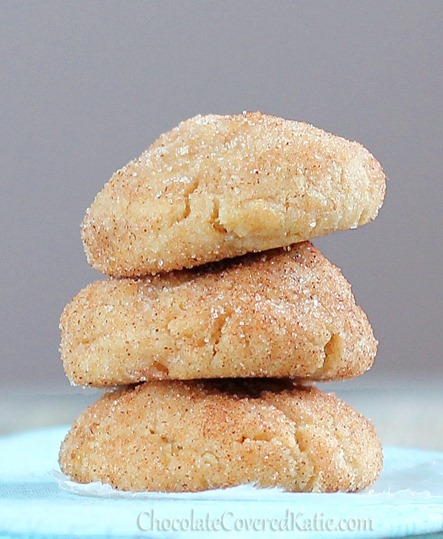 These light and fluffy homemade sugar cookies are always a big hit with both vegans and non-vegans, and they’re the perfect holiday cookie to give as a gift. But if you do want to send them to others, I’d definitely recommend making extra so you can keep some for yourself! 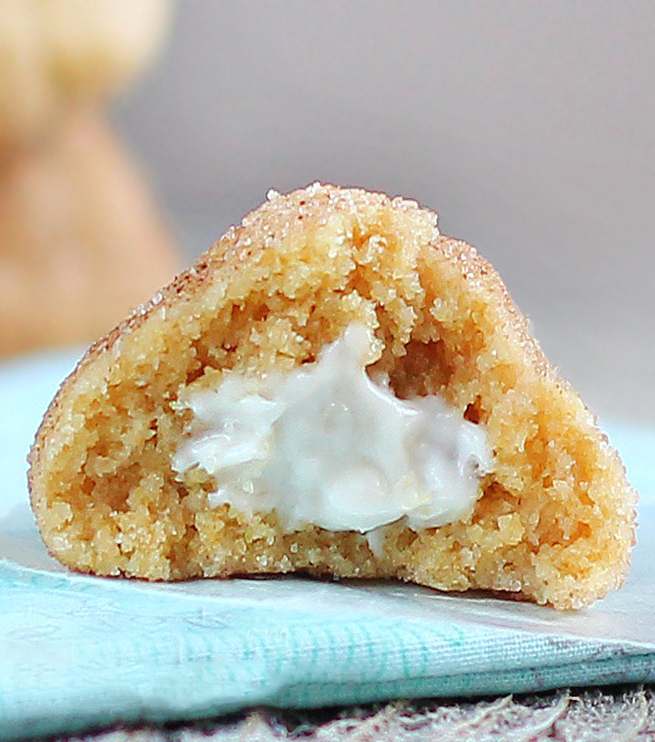 For the filling (which you can omit if you want non-stuffed cookies), combine 4 tsp powdered sugar or Sugar-Free Powdered Sugar with 1/4 cup cream cheese (such as TJ’s vegan), gently warmed or brought to room temperature so it’s soft enough to stir or beat with the powdered sugar until smooth. In a mixing bowl, combine first five ingredients, and stir well. Stir in the oil, milk, and vanilla to form a cookie dough. Only add extra milk if it’s still too dry after a full minute of stirring. (I’ve never had to add more than the 1 1/2 tbsp milk.) Smush into a giant ball with your hands, or transfer dough to a plastic bag and smush into a ball once the dough is inside the bag. Now roll into balls. Break balls in half, flatten each half a bit and add a little filling to one half, then place the other half on top and re-roll. Chill 30 minutes or up to a day. Preheat oven to 325 F. Roll balls in cinnamon sugar, place on a baking tray, and bake on the center rack 11 minutes. They’ll look underdone when you take them out, so let them cool about 10 minutes on the baking tray and they will firm up as they cool. 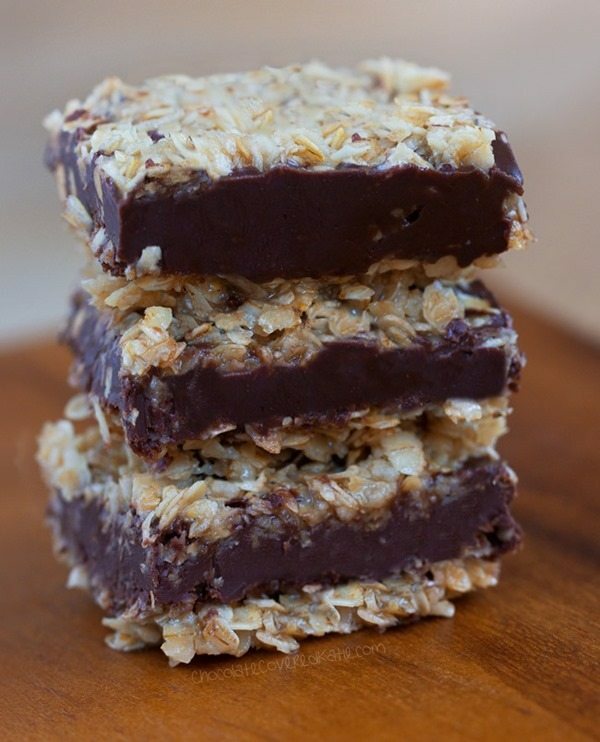 These look awesome and I can’t wait to try them Katie! For cookie flavors how about Fruit Cake, Stuffed Cornbread, or Chocolate Lemon? 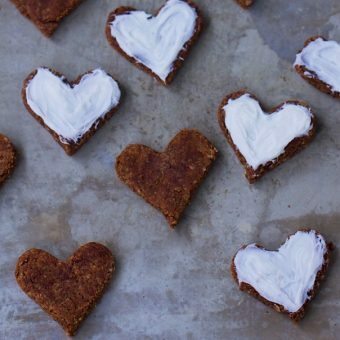 This isn’t a crazy flavor but I want fresh baked gingerbread cookies for the holidays! And third it, fourth it, fifth it… into infinity! I have recently loved pouring So Delicious coconut milk eggnog into my hot cocoa. How about Chocolate Eggnog Cookies?? I also want to ask in a separate comment; for Christmas every year we go up North (or at least, farther North) to visit my mom’s extended family, several members of which are diabetic and could use a healthier/lower sugar option for desserts, since the typical dessert there consists of super-decadent cupcakes, huge cream puffs, pineapple cheesecake… you get the picture. (I could use healthier options too, since I can easily go through 20 units of any dessert item in a sitting… it’s a miracle I’m not morbidly obese yet). Do you have any recommendations? Maybe ask your relatives what’s acceptable on their specific diets, then see if any of the cookies are a match (especially if you use the xylitol options). I can say as a Type 1/insulin dependent diabetic that all of Katie’s recipes I’ve tried (which is a lot of them) have worked fine for me and I use the real sugar. As for carbohydrates I think it varies by person and you can’t put all diabetics in a box. I average 250 grams a day which is not low carb. I exercise daily and average less than 18 units of insulin via an insulin pump which is a very small amount considering I don’t produce any of my own. I would take Katie’s suggestion and ask the people to see what they’re dietary needs are because everyone is different. 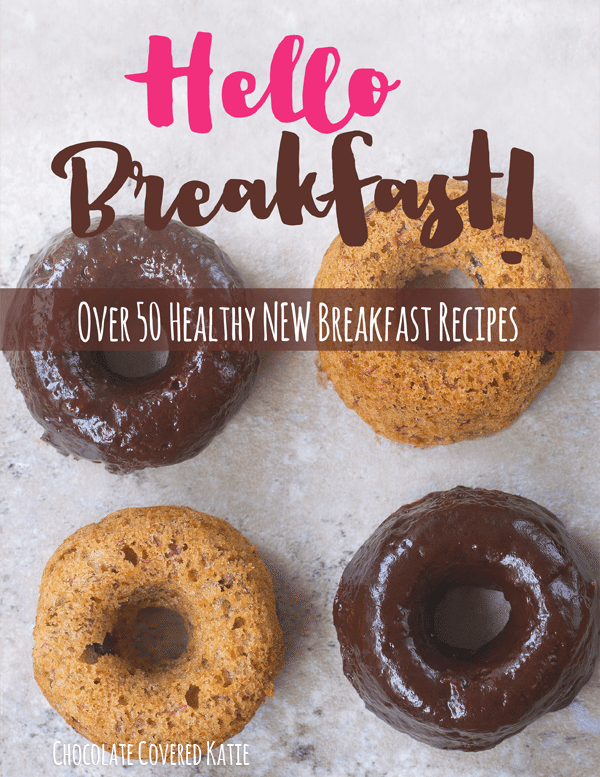 Another point I’d like to make is that recipes with more healthful ingredients that do contain real sugar don’t spike the blood sugar like ones with a lot junk. So the source of the carbs makes a difference too. i know diabetics, have to avoid lots of carbs, so of course a sugar free substitute would be needed for whatever you make. if you use one that measures like sugar you can do any recipe and just switch it for the sugar. If you use stevia but not the baking kind there are still lots of recipes around that use the packets/stronger kind. 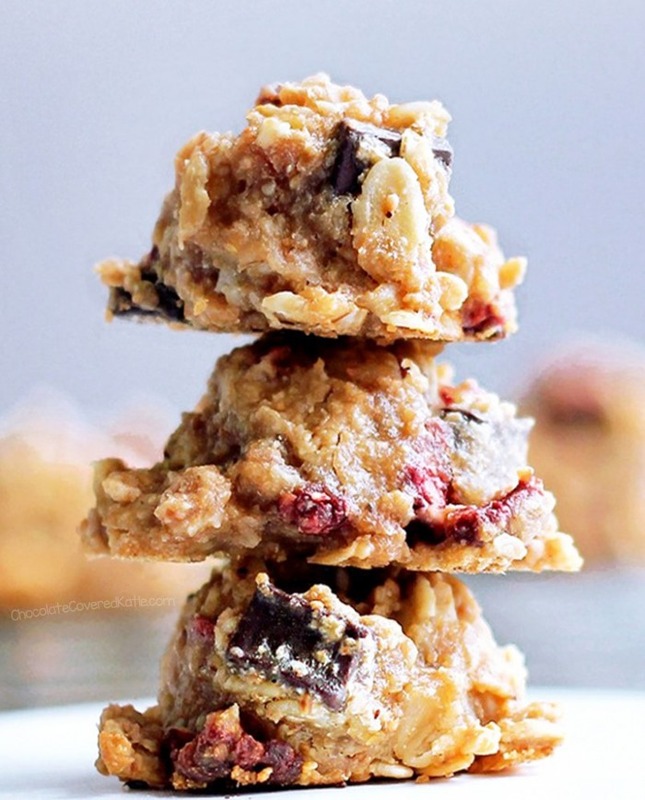 (this site uses those in a lot of recipes) Another thing you could try is almond flour. There is carbs in it, but its super low. there are lots of recipes you can make with it, or even sub it in for regular flour in some recipes. My husband (type II Diabetic) has blood sugar spikes from wheat, even whole wheat. Apparently this is not unusual. Wheat seems to affect him as much as sugar does. Its funny that you mention that. I just saw a dr oz yesterday that did a test about that…some dr was on stating that even whole wheat causes problems and can spike your sugar worse than a candy bar. Dr oz tested it out on 5 people and it was true for 3 out of the 5 people. Whole wheat bread actually spiked twice as bad as a whole chocolate bar. I believe he was referring to Dr. Davis of “Wheat Belly” fame. We’d already figured it out with dh, but hearing that this is really common just made me mad. Kind shoots “healthy whole grains” in the foot. chocolate chili lentil and garbanzo bean cookies (chocolate chili cookies for short). Mmmm!! I’ll have to experiment with the gluten-free, sugar-free option for this. 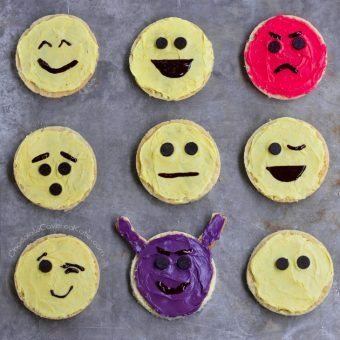 Please make some gluten free cookies for us Celiac and gluten intolerant/ allergic people, please and thank you 😀 What about Almond-Orange-Chocolate Cookies, Chocolate Cherry Almond Cookies, Salted-Caramel Chocolate Cookies, Lemon Pistachio Cookies, or Green Tea Lime Shortbread. Oh the possibilities!! How about chocolate with bacon bits cookies? Or Fak’in bits as Katie is Vegan! I think you should really tackle a chocolate-chili cookie. I love that flavor of chocolate bar, but never had it in a cookie. It would be sure to be good if you designed it. Haha I already sent all my brainstorming ideas on twitter, hope you find some good ones! those look amazing! i love the yummy center! one question – why do you include both baking powder and baking soda? aren’t they the same thing? Baking soda and baking powder are different, but the difference is minimal. Soda needs to be combined with something acidic when baking to make the baked good rise. Powder already has that acidic ingredient in it (cream of tartar). Baking soda is purely sodium bicarbonate, but baking powder has cream of tartar and (usually) cornstarch. There’s also the difference if single and double acting baking powder which I won’t get into. Hope that explains it! Yummy! What original cookies! How about red hot orange cookies? Or peanut butter molasses cookies. This is a very creative idea! 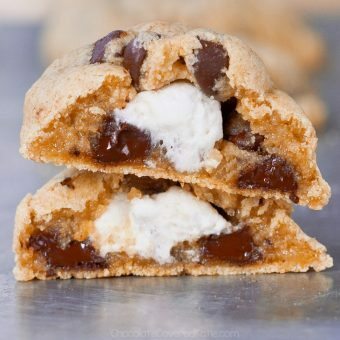 How about a smore cookie? Have you tackled that one yet?? Yes! I want a smore’s cookie!